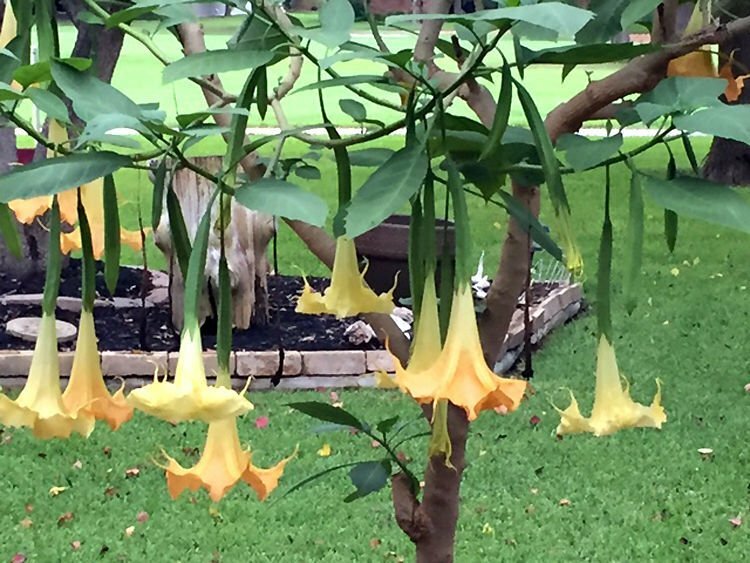 Brugmansia is a close relative to the angel trumpet, but its flowers hang downward. It usually can handle light freezes. 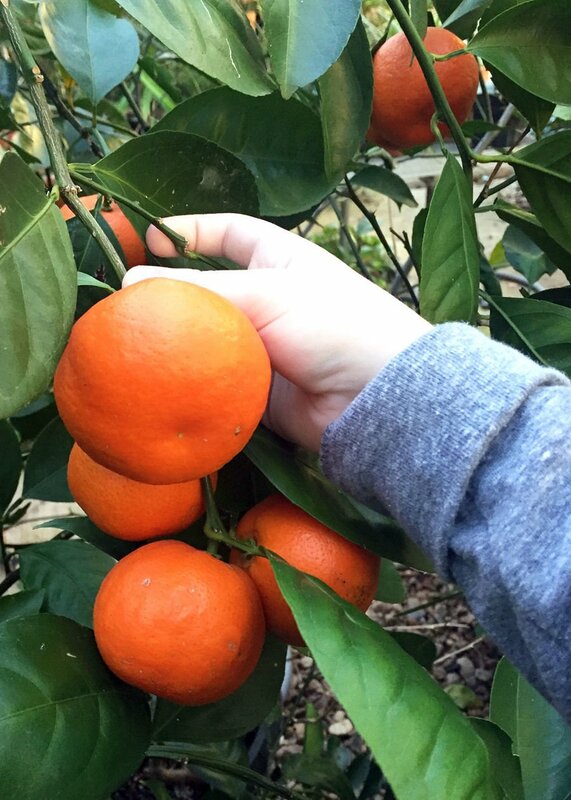 While Satsumas are among the cold-hardiest citrus fruits, they still fare best in the warmer parts of Texas. Dear Reader: This is a Brugmansia, close relative of the native jimson weed (Datura) that is also commonly known as angel trumpet. The various Daturas hold their flowers at a more or less upright habit, while Brugmansias’ flowers hang downward. Dear Reader: My own personal choice would be purple wintercreeper euonymus if it’s a sunny location and either mondo grass or maybe liriope if it’s shaded. All will need to be watered during the dry times, but they’re excellent at holding the soil. Dear Reader: Satsumas are among the cold-hardiest of the many types of citrus, but they still are limited to the warmer parts of the state. They’ll do well with infrequent protection from record cold in the southern third of the state. In the middle third of the state you’ll need to protect them much more often, and in North Texas they really ought to be left in pots that can be wheeled into protection when the temperature drops into the mid- or low 20s. Texas A&M has several fact sheets available online talking about their work with Satsumas over the past 25 years. A new introduction called Orange Frost has shown superior cold tolerance into the mid- to low 20s if it’s given protection in its first few years of establishment. Of course, we have to remember that this is always Texas, and records are made to be broken, cold extremes included. Dear Reader: No, other than to keep the grass properly nourished and watered regularly. Even if you were able to add organic matter to the soil prior to planting that’s not a critical improvement. Organic matter does loosen clay soils, but it also decays over a period of a year or two and disappears from the soil. In doing so, it leaves you with just what you started with originally. Dear Reader: There are several possibilities, but a change in lighting is by far the most likely cause. We think of ferns as shade-loving plants outdoors, and to a degree that’s true. They don’t tolerate our Texas sun very well at all. However, when we bring them indoors we have to give them the brightest light possible. In fact, I have mine growing in my greenhouse with a minimal amount of shade fabric overhead. They tolerate the winter sun quite well. DEAR NEIL: I have beds of monkey grass and Asian jasmine groundcovers. Can I dig plugs from them like I do grass and move it like sod? Dear Reader: You can do that with monkey grass, also known as “mondo grass,” but Asian jasmine doesn’t form roots along its stems, so it would be very damaging to your planting of jasmine to try it with it. Actually, with the mondo grass I dig tennis ball-sized clumps and replant them 7 or 8 inches apart checkerboard-style. That lets their leaves overlap slightly for a more established look, and it lets the bed fill in very quickly. I have needed a good bit of it over the years, and my old beds have served as my source every time. Dear Reader: Those are called “hardwood” cuttings. They’re taken in February and carefully stuck into well-prepared garden soil so that the end that was closer to the roots is always inserted into the ground. The cuttings should be 7 or 8 inches long and you’ll want to cover them with a large glass jar for a few weeks to hold in the sun’s warmth.